To activate your Multicolored LED Balloon, press the button located on the inside of the mouthpiece. Each press of the button changes the color of your balloon (7 still light choices; no flash), then lastly you can set it to slowly transition through all the colors like a rainbow. NOTE: Before inflating, turn the LEDs on and pull the ribbon attached to the balloon until it’s unwound. Fill lit balloons with helium to maximum capacity for longest float time. For brightest results, use in the dark. Dimensions: Height: 15 in. Diameter: 8.75 in. Ribbon Length: 48 in. 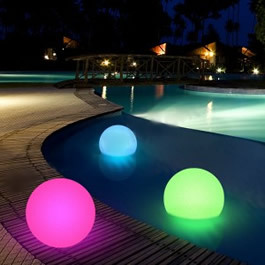 LED Colors: Red, Jade, Blue Balloon Color: White Multicolored LED Balloons come ready to use with non-replaceable batteries.